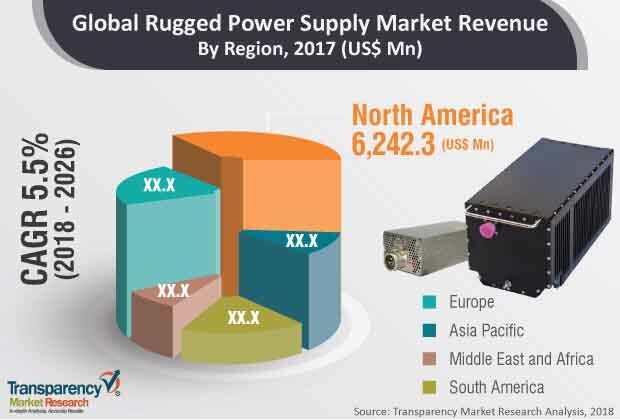 The global rugged power supply market was valued at US$ 16,302.8 Mn in 2017 and is projected to expand at a compound annual growth rate (CAGR) of over 5.5% from 2018 to 2026, according to a new report published by Transparency Market Research (TMR) titled ‘Rugged Power Supply Market – Global Industry Analysis, Size, Share, Growth, Trends, and Forecast, 2018–2026.’ This is mainly due to development of advanced military power supply systems as well as early adoption of COTS (commercial off-the-shelf) software. Moreover, huge demand for rugged power supply across telecommunication and healthcare industries is expected to propel the market during the forecast period. The global rugged power supply market has been segmented based on type, component, system type, industry, and region. Based on type, the market has been divided into programmable and non-programmable segments. By component, the market has been categorized into hardware and software. The hardware segment is further sub segmented into DC/AC convertor, AC/DC convertor, DC/DC convertor, EMI filters and others (inductors, transformers, etc.). In terms of system type, the market is segmented into discrete power supply system and integrated power modules. In terms of industry, the market has been segmented into telecommunications, medical & healthcare, military & aerospace, transportation, lighting, food & beverage, and others (mining and construction). Based on geography, the market has been segmented into North America, Asia Pacific, Europe, Middle East & Africa, and South America. In terms of industry, the military & aerospace segment is anticipated to constitute a significant share in 2017. The segment is expected to be driven by factors such as the rising demand for next generation rugged power supplies to withstand extreme and harsh environments.This can be further attributed to the rising trend of incorporating digital power management and control solutions in military power supply products. Further, the power supply equipment replacement cycle is getting shorter. The military sector is responsible for safeguarding sensitive data such as information related to national security, weapons, defense systems, strategies etc. The need toprotect sensitive electronic devices from grid power quality instability is increasing significantly. Adopting smart grid systems & renewable energy sources can improve grid reliability. Smart grid technology in power supply systems can improve the amount of uneven renewable generation in power systems. Smart grids stimulate energy saving in power supply systems by improving the utilization efficiency and power consuming efficiency. Also, increase in use of equipment demanding higher voltage is paving the way for new market opportunities and hence contributes to the growth of the market. In terms of geography, the global rugged power supply market has been classified into North America, Europe, Asia Pacific, Middle East & Africa, and South America. North America is anticipated to hold a significant share of the market over the forecast period followed by Europe and Asia Pacific. This is primarily due to the United States. The U.S. holds approximately 45% of the global defense budget and has the strongest military power at present. The presence of advanced military power supply technology as well as early adoption of COTS software in the U.S, has made North America a global leader in the global rugged power supply market. Further, the market in Asia Pacific is predicted to be among the fastest growing due to ongoing technological innovations, expanding at a significant CAGR. The market in Middle East & Africa is forecast to witness moderate growth due to presence of world leading military forces in GCC countries. South America is expected to showcase sluggish growth in the rugged power supply market as compared to other regions. The research study includes profiles of leading companies operating in the global rugged power supply market. Market players have been profiled in terms of attributes such as company overview, financial overview, business strategies, recent developments, and SWOT analysis. Some of the key players operating in the rugged power supply market are XP Power, Advanced Conversion Technology, Eaton Corporation, Aegis Power System, Inc., TDK-Lambda Americas, Inc., Abbott Technologies, AGMA Power Systems Ltd., Energy Technologies Inc., Synqor, Inc., AJ’s Power Source Inc., Prime Power Inc., Powerbox International AB, Milpower Source, Astrodyne TDI Power Supplies & EMI Filters, Artesyn, Behlman Electronics, Inc., Cosel, Dawn VME Products, Delta Electronics, Extreme Engineering Solutions, Inc., General Electric Ltd., Mean Well, Murata Power Solutions, Rantec Power Systems Inc., Siemens AG, VPT, Inc. and Mitsubishi Electric Corporation.